Two crosses fashioned from red roses mark the spot where a car bomb killed three people last December in Pyatigorsk, Russia, roughly 170 miles east of Sochi. Just weeks later, assailants murdered six local men and left their bodies in cars surrounded by explosives on the edge of the city. The violence has rattled the Stavropol region, the only predominantly Slavic area of the North Caucasus. It has also focused attention on local Cossacks, an arch-nationalist element dedicated to upholding Russian authority and thwarting a radical Islamic insurgency that has claimed hundreds in the last two years. “How can we forgive them for this?” asked 61-year-old Yuri Churekov, the chief, or ataman, of an unregistered group called the Caucasus Line Cossack Host. Churekov was referring to Islamic militants who he suspects carried out the recent attacks in Stavropol. In recent years, local authorities in southern regions have increasingly relied on Cossacks as a supplemental security force, backing up Interior Ministry personnel in the policing of towns and cities. Highlighting the trend, over 800 Cossacks from the neighboring Krasnodar region were summoned to help secure Sochi during the Winter Olympics. 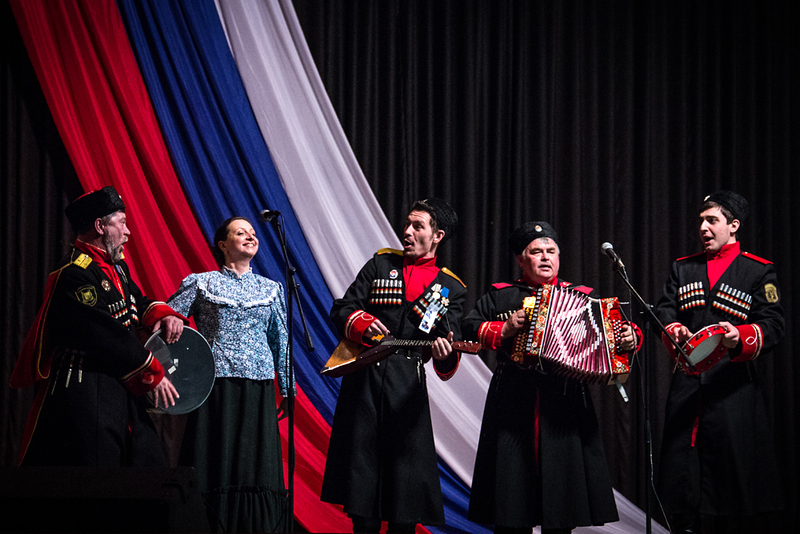 Cossacks have also emerged as a potent political force in recent years, receiving growing financial support from President Vladimir Putin, who has praised them for their “well-known traditional patriotism” and their “unique and rather positive role” in “promoting the ideas of nationhood in our people’s consciousness.” Many, including the official Russian census, consider Cossacks to be a narod, a distinctive national group apart from the regular Russian Slavic population. In the Stavropol region, local authorities are starting to bump up against the reality of empowering people whose “traditional patriotism” is intertwined with a fierce libertarian streak, and whose “idea of nationhood” is historically rooted in personal loyalty to the tsar, while featuring a loathing of the state apparatus. “A Cossack is a free man, first and foremost. He should be a free man. Yes, he is a statist, he is a defender of his homeland. … But with his own territory and his own governance. And if he does not have those two traits, he is not a Cossack,” Churekov said. Such attitudes raise questions about how well authorities can supervise and control Cossacks who have been empowered with law-enforcement responsibilities. Some local observers ask: in going about trying to prevent crime, are Cossacks following the law? In addition, recent developments have heightened concerns that some Cossack elements are trying to use their elevated stature for personal economic gain. The situation also is stimulating a schism among Cossacks, compounding an atmosphere of instability. Today, Cossack groups in Russia fall into two main categories: those registered with the government, and independent coalitions. The official registry contains 11 distinct voiska, or hosts, across Russia, including outposts in Moscow, Vladivostok, and Stavropol, home to the Terek Cossack Host. Officially recognized groups receive state support, typically in the form of money or land, and actively cooperate with law enforcement agencies. Legally, Cossacks cannot hold weapons or make arrests, but they do carry out patrols and perform what their leaders describe as a “pedagogical” function involving people suspected of committing crimes. Their influence, they claim, comes solely from the moral weight of their presence. The term Cossack derives from the Turkish word qasaq, meaning free man, or adventurer. Throughout their history, Cossacks have played myriad, and often alternating, roles: oppressor and oppressed, vassal and rebel, zealous conqueror and defender of the downtrodden. Their history is tainted with violence against Jews and Muslims, and they also participated in uprisings against the Tsars, most notably Pugachev’s Rebellion in the 1770s. They were instrumental in the expansion of the Russian empire, but they also tended to stick to distant lands, striving to remain just beyond the reach of imperial authority. After decades of persecution at the hands of the communists, a revival of Cossack traditions began during the late-Perestroika era. In the 1990s, then-President Boris Yeltsin courted Cossacks’ favor, both as political partners in the turbulent south and as battlefield backup against the Chechen insurgency. Some in Stavropol now oppose the incorporation of Cossacks into official law-enforcement structures, asserting that it dilutes the purity of the Cossack identity by subordinating traditionally sovereign warriors to local bureaucrats. These detractors also point to what they see as the mismanagement of funds and land allocated for Cossack use, questionable selections of chieftains, and inadequate responses to recent attacks on Slavic youth. Last June, the ataman of the officially recognized Terek Cossack Host, Sergei Klimenko, became embroiled in scandal after he a sent a letter to President Putin demanding the transfer of highly valuable regional assets to Cossacks. The wish list included access to fishing in the Caspian Sea (and its lucrative caviar trade), control of a famed brandy factory in Dagestan, authority over mineral water and spas in the region, and 100,000 hectares of arable land. By October, Klimenko was forced to resign, following allegations of corruption, and a loss of confidence in his leadership. Some of his peers claimed that he brought about “nothing except promises, intrigue, and the collapse of the host.” A permanent successor has yet to be chosen, and the ongoing instability has sent reverberations through the community. Klimenko’s departure followed shortly after the resignation of regional governor Valeriy Zerenkov, whose handling of a ban on hijabs in local schools reportedly inflamed ethnic tensions. Zerenkov’s exit marked the fourth leadership change in as many years for the troubled region. The disarray among officially recognized Cossacks, along with fast turnover in the region’s top political leadership, may open the way for more vigilante-justice-minded Cossacks to assert themselves, such as Churekov, the leader of a Cossack host not recognized by officials. Churekov, a burly figure with spider veins running down his right temple, would like to see, among other things, “a return to the methods of [General Alexey] Yermolov,” a man whose brutality inspired Pushkin to write the line, “Bow down your snowy head, submit, O’ Caucasus, Yermolov is coming.” His preference also appears to be for local inhabitants to take the law into their own hands. Noah Sneider is a freelance journalist living in Russia.